The Phillies have freed up your week with their dominance. Join Grid tomorrow (Tuesday) at Earth Bread + Brewery in Mt. Airy to celebrate the November issue. There will be $4 brews from PBC, delicious flatbreads (try the "Seed") and lots of interesting conversation to be had with Grid fans and featured players from Greenprint, this month's green building insert (done in conjunction with DVGBC). 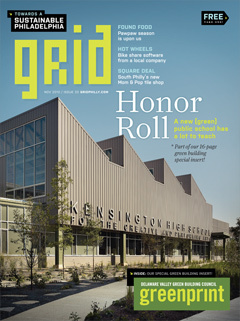 Grid November Issue Release Party: Tuesday, October 12 at Earth Bread & Brewery, 7136 Germantown Ave. (just steps away from the Allens Lane stop on what used to be the R8), 6 - 8 p.m., featuring discounted PBC beers. Click here for more.